We offer a broad range of antibodies, kits and dyes to monitor proliferation. Proliferation can be measured through dye incorporation into live cells, by measurement of protein levels of key proliferation markers or through incorporation of Bromodeoxyuridine (BrdU), a thymidine analogue. alamarBlue assays are a convenient and quick way to measure cell proliferation and cytotoxicity in human and animal cells, bacteria and fungi. We have antibodies, including PrecisionAb™, against common proliferation markers such as Ki-67, proliferating cell nuclear antigen (PCNA), minichromosome maintenance 2 (MCM 2) and against Bromodeoxyuridine (BrdU) a thymidine analogue, added to culture media and incorporated into newly synthesized DNA. 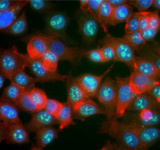 In addition to our cell proliferation reagents we have antibodies, kits and reagents to detect cell viability apoptosis and autophagy so you can have confidence in the health of your cells. T cell activation and proliferation provide an effective method to determine immunocompetance and cell reactivity. However choosing the right stimulation protocol and knowing when to use it may vary depending on what cell type you are starting with and the result you need. To help you we have grouped a few simple protocols for T cell stimulation, with some useful background information so you can choose the right method. alamarBlue is a registered trademark of Trek Diagnostic Systems, Inc.